32 p. : chiefly col. ill.
Wow! 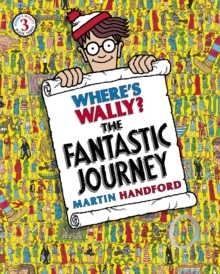 Another fiendish and fantastical challenge in Wally's third classic activity book!Join Wally on his quest through magical and bizarre fantasy lands in his third best-selling classic adventure. Hidden in every intricately-detailed scene are Wally and his friends - so let the hunt begin! Full of eye-boggling extras, there's hours of fun to be had! Amazing! The Where's Wally? series has sold over 72 million books worldwide.